One of the many uses of CD replication is for business marketing and advertising. Many companies now turn to the method of distributing advertising, marketing and corporate information by means of CD replication. Nowadays replicating a CD or DVD is often far more cost effective than printing a glossy brochure or catalogue. A standard CD can carry up to 700 MB of data which is more than enough room to accommodate substantial marketing information and images, usually in PDF file format. The manufacturing process of CD replication can yield thousands of bit for bit copies of a CD master in around 6 days and for as little as 12 pence per disc. Discs can be supplied on shrink wrapped spindles or supplied in a variety of cases with appropriate printed inlays. 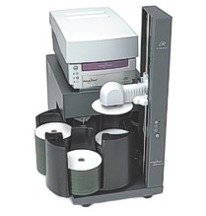 When compared to paper printing the CD and DVD replication option is cheaper and also the distribution costs of CD/DVD are usually a lot lower. These are the main reasons why many corporate business’s now make the wise decision to use CD/DVD replication or duplication rather than traditional printed matter. So when you are considering your companies next marketing or advertising campaign be sure to consider the option of duplication or replication of discs. This entry was posted on Friday, December 18th, 2009 at 12:41 am	and is filed under CD Replication Articles.